Greetings from Lake Almanor The Jewel of Plumas County! Surface temps at 70.5 degrees at midday. Clarity is good, about 16 to 17 ft. depending where your are. Moon phase is waxing. Next full moon is Sept. 16th. It was cool here last week, but it's warming again for the next 10 days or so. As summer wraps up, the big fall fishing season is in the starting blocks. That’s right, “Whopper Time”. Biggest fish reported this week a 7 lb. Rainbow. Yea that’s a whopper alright. Most boats are trolling in the east basin and a few on anchor bait fishing or jigging in the usual spots, like the A-Frame, Rec.2 and Big Springs. Lake levels are still good, but the lake is 5 ft. lower since the July 4th weekend which is normal. Current lake levels from the Dept. of Water Resources have Lake Almanor at 4488.35 foot elevation with 993,326 acre feet storage. We been doing pretty well and other boats scattered all round the east basin are also reporting some strong outings, 13 to 15 hook ups is a good morning. It's all about the smelt now, most fish checked were holding smelt, which are about 2 to 2.75 inches long now and looking good. Huge clouds of bait fish are scattered all over the east basin as hungry fish are in pursuit, pushing them everywhere. Fish reported run from some small planters to Rainbows to 6.5 lbs. However the average size has been about 2.12 lbs. which is not a bad average. We've been running fast action lures 34 to 38 ft. deep early, and dropping down as the sun climbs, until we eventually are catching fish only on the deeper rods 8 to 10 ft. off the bottom. 1/6 oz. Red and Gold Speedy Shiners (RGSS) have been the ticket for me. I've been running 4 of them every day for the last 8 outings, popping off some real beauties from 18 to 24 inchers over 5 lbs., all Rainbows. Also I've been adding scent to these lures. Pro-Cure Trophy Trout and Carp Spit scents lightly brushed on can only help. #2 needlefish and small silver Kastmasters have also reported hookups. The east shore from Canyon Dam to the Dorado, East Peninsula, Rocky Point and Big Springs seem to be holding and reporting the most fish. Slow action has been working also, Gulp smelt trolled slow, like .06 mph real slow, so that looks like a easy meal for a big lazy fish, but fast action has been hot. A couple Salmon reported but the numbers are way down from previous years, about 99% down, very concerning. It was reported that 33,000 fingerling salmon were planted last year..only 4 inches long. That is “snack size” to bigger fish and it's hard to believe that many of them made it. 4 inch is way too small to plant here, what a waste. 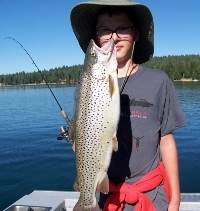 Not a lot of Browns reported either, which has locals worried that the “Brown Trout” population at Lake Almanor is in real pearl of perishing in the next few years. Believe me, over fishing of Browns or taking daily limits of Big Browns home to just feed the neighbors “will be frowned upon” going forward. Greatly reduced King and Brown trout plants by DFW are beginning to really impact this once great Brown Trout and King Salmon fishery. 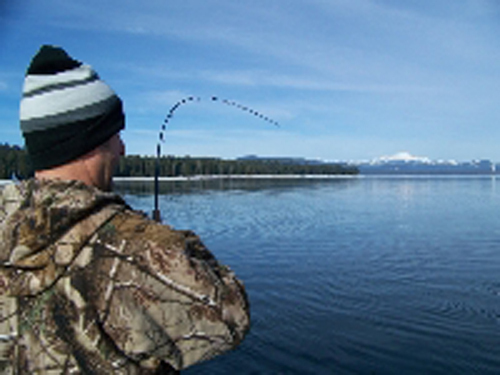 And later it will impact the local economy that relays on the Chester, Lake Almanor area drawing in visiting anglers. DFW stating that Browns and King Salmon are “Not Native”, and they are eating all the yellow legged frogs is wrong. I've been cleaning fish here for 17 years and have never seen a yellow legged frog inside a fish, or even hopping around the lake, Ever! Another thing Amphibians really don’t flourish here at 4500 ft. elevation, which can get well below zero degrees in winter. DFW now saying that Browns and Kings are not native is strange, as this is not a native lake, it's man made, Browns have been here 80 years, and Kings for 30 years, so whats the problem? Keep planting I say. Aren't you sick of every aspect of government taxing you more and giving you less? And now it's coming down to our fish. As we move closer to the Brown Trout fall spawn I encourage folks to take a quick picture and release it. Hoping that they can naturally reproduce unharassed. 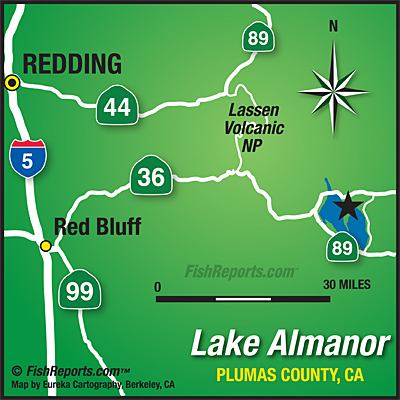 I also encourage folks that care about Lake Almanor to join the local Almanor Fishing Association, in greater numbers we have a stronger voice.